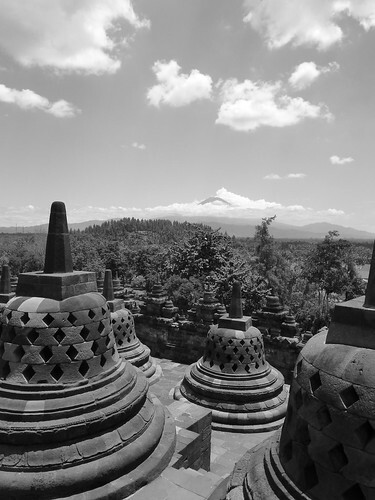 Our 8th country on the trip was Indonesia, and the island of Java. We had decided to skip Jakarta - supposedly the Manila of Indonesia - and went straight to Yogyakarta (more commonly known as Jogjakarta, or simply "Jogja", pronounced JO-JA). Some fun was had at the airport, since Singapore has two main terminals and a budget terminal; we’d expected AirAsia to fly out of the budget terminal, since it is a budget airline. We didn’t actually think to check our tickets until we arrived at said terminal and couldn’t find the AirAsia check-in desk. A scan of the ticket revealed we actually needed Terminal 2, and there was only an hour left until take-off. Whoops. Thanks to the skytrain and a regular shuttle bus, we were fortunate to get there and through security quickly, and even managed to nab a Subway on the way to the departure lounge. We got there in the early afternoon, then decided to pass up the taxis in favour of a local bus to our road. You get to see more of a place from a bus rather than a car, and you also get to see some of the locals as well. 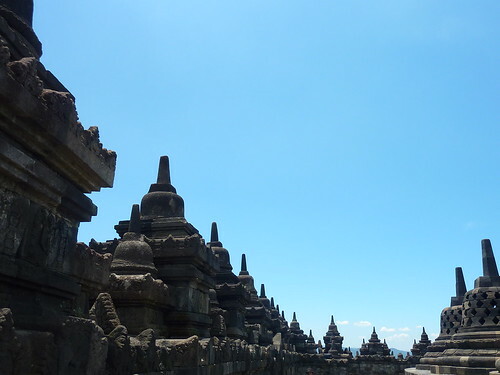 The added bonus in Jogja is that you can get anywhere in the city on a bus for the grand price of RP3000 (21p). The downside is that it takes an age as the bus routes are so incredibly convoluted that you have to wonder if the Kuala Lumpur planning committee had interfered in Indonesia. After about an hour on the bus, we finally checked into our booked accommodation (Ndalem Suratin), dropped off some laundry and went out for food. Our room was a fan room. 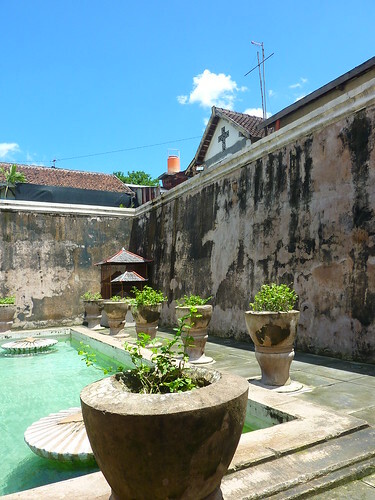 One recommendation for Jogjakarta - it's worth splashing out on air-con if you can afford it. When you become accustomed to the heat, it is bearable, but it's an uncomfortable 20-25 minutes. Other than the heat and the lack of space, it was quite comfortable - I think we were the only other people staying there though; there was building work going on (the place might be pretty nice once complete), and even though it was a shared bathroom it seemed like we were the only people using it. The next day we ate our traditional Indonesian breakfast of fried rice (tea and toast also available, thankfully), before getting a bus to the Kraton - the centre of the city where the palace sits. At least, we tried to. The bus conductor must have taken a guess at where we wanted to go to and by the time I'd noticed us going past the the place, it was too late. The next stop was a good 2km away, so we had to catch another bus back to avoid getting blasted by the heat. Without a doubt, this is the hottest place we've visited on the trip, with the temperature going steady at 32 degrees for most of the day, every day. It was almost unbearable to be outside in during the daytime, especially over the lunchtime hours. When we finally got to the palace, it was something of a disappointment. The parts open to the public were all outside, and consisted of marbled covered areas supported by pillars. 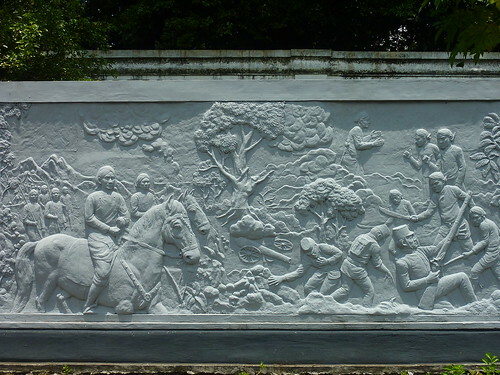 A volunteer guide who was obviously hot and bored took us around, telling us in a fairly monotone voice about all of the sultans who had previously ruled Jogja. Some of them had over 40 wives and over 100 children. Obviously gluttons for punishment. He showed us some of the traditional dress that is worn during ceremonies, and also the highlight of the palace - the reliefs (although he didn't seem to know much about them). 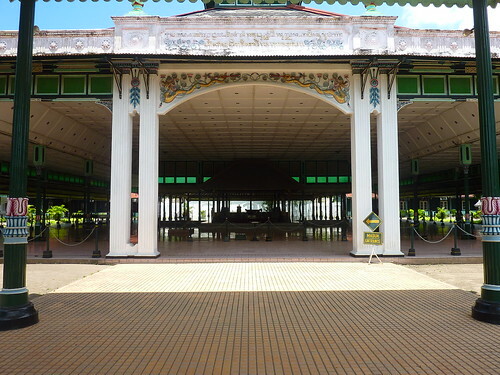 There is a huge, barren wasteland in front of the palace where local people gather and the Sultan makes offerings once a year in an attempt to maintain the health of himself and his people. We moved on from the palace to the Water Castle. This was a far nicer place to visit, with plenty of decent photo opportunities in a serene location. On the way we were joined by a local who claimed to work there, and there seemed to be a wordless agreement for him to show us around the place. His English was pretty good, and his information about the Water Castle was interesting, even though he clearly didn't work there and we were "being Bangkoked" for want of a better phrase. Still, we went along with him regardless. We knew we'd probably end up somewhere where he'd try and sell us something but until that time we were happy to have a guide. He first took us to the mosque underground - somewhere we'd probably not have found ourselves. 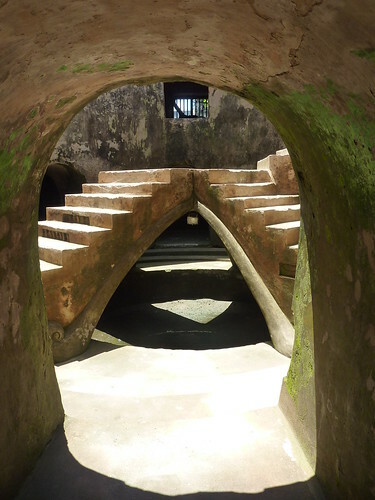 It was like something from north Africa, all roughly carved doorways and weird acoustics. 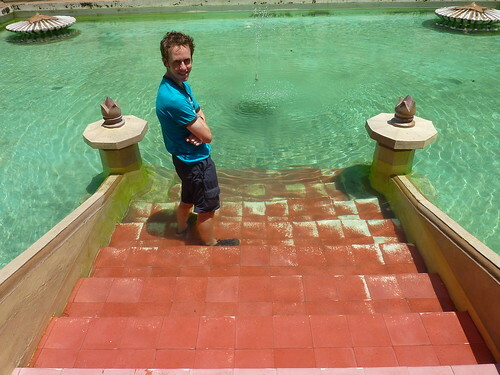 We then moved on to the palace proper, which still had running water in the pools, and there were plenty of them. 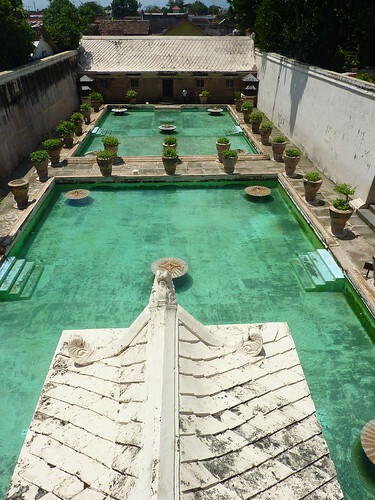 The Sultan had his own private pool back when it was occupied, and he would view the large public pool from an overhead gallery (bottom photo shows the view he had) and select a wife/mistress who was swimming there to join him in the smaller private pool. The water castle is only small, so we were only there for about 25 minutes or so. 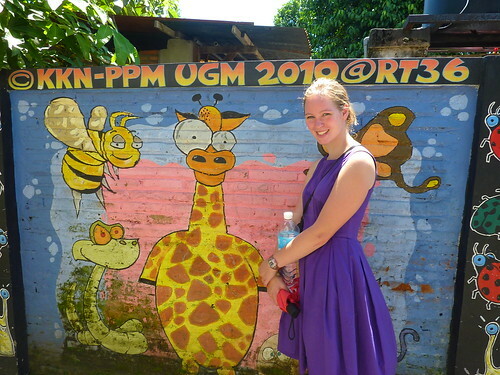 There was a batik shop outside and we went in to take a look. 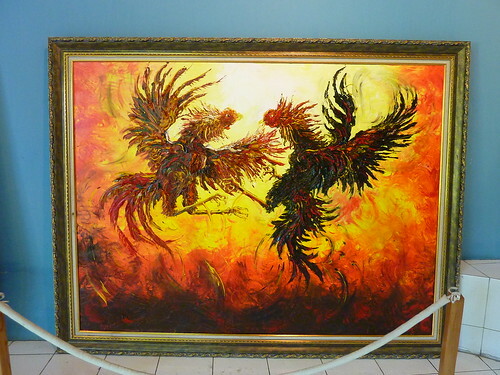 Batik painting and batik in general is a huge industry in Jogjakarta. 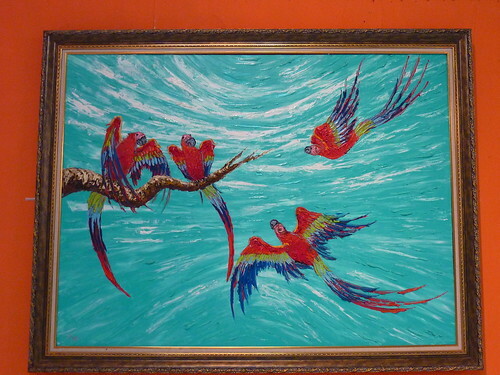 Some of the paintings are very intricate, and we spent a bit of time talking to the owner who was also a painter. We considered a couple of paintings before looking at a third, and his face lit up. "This is my work," he said. It took him a couple of weeks to make and another week to colour and it was rather nice. Despite our determination not to get loaded up with souvenirs, we decided to take a punt on the painting and got a very reasonable price for it. As batik is done on cloth, it folds up small and is lightweight. Let's hope we still like it, and can find a frame for it (oh, and a house too...) when we get home. Eventually, we arrived at his home. It was a batik shop. Imagine my surprise. He sat us down, offered us some free water (which we politely refused as we didn't want to feel obligated in any way) then got his "brother" to show us various batik postcards and paintings, all of a much lower quality than the place we'd just been to. We were probably sat down for about 2 minutes before we left. They didn't seem particularly fazed. 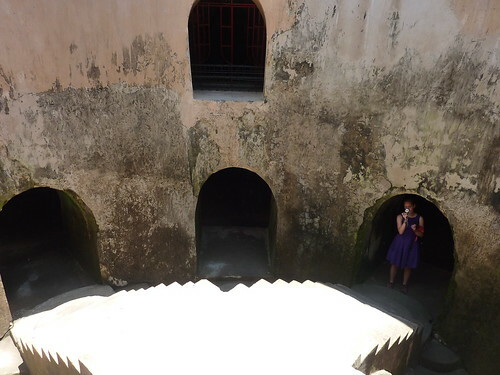 Trying to get out of the Kraton was a nightmare. There aren't many exits to the main city, and the complex is huge. Combine this with the sweltering heat and the fact that Gilly's 7-Eleven umbrella finally falling to pieces after a mere eight uses, and we weren't in the best mood by the time we got to ViaVia for lunch. Thankfully, the food was so good, we forgot all about the heat (well, mostly). 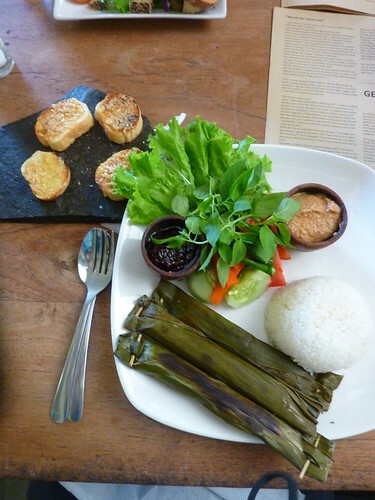 I had otak-otak tengiri - grilled mackerel, rolled into an cylindrical fishcake inside a banana leaf and served with rice and sambal, a spicy sauce. It was excellent. 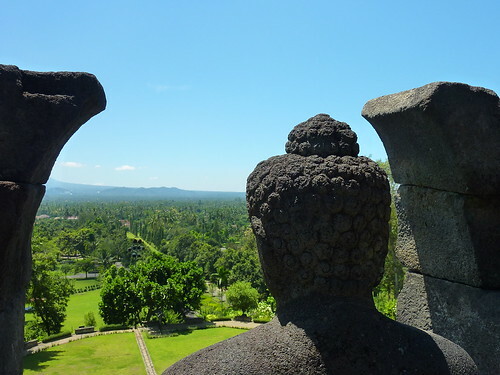 The main purpose of visiting Jogja for most travellers is Borobudur. 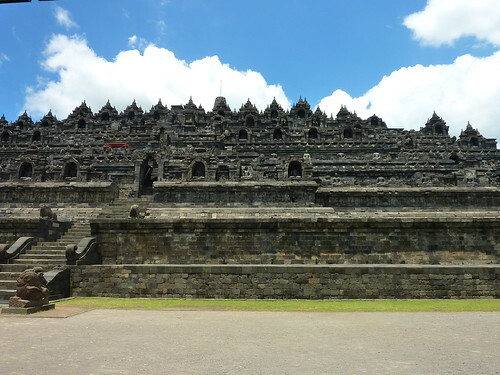 It’s the Indonesian equivalent of the Angkor park, but it’s only a single (very large) temple, rather than a complex of them, and it was our destination the next day. 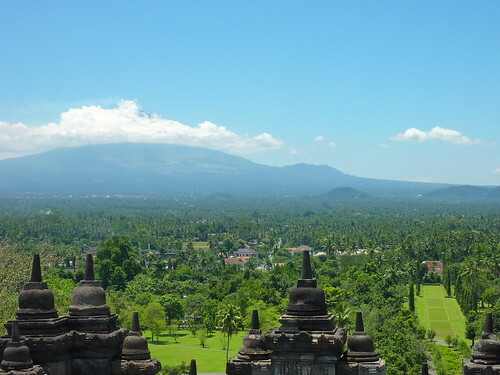 Rather than paying silly money on a tour there and back, you can get to Borobudur on a local bus for a fraction of the cost. 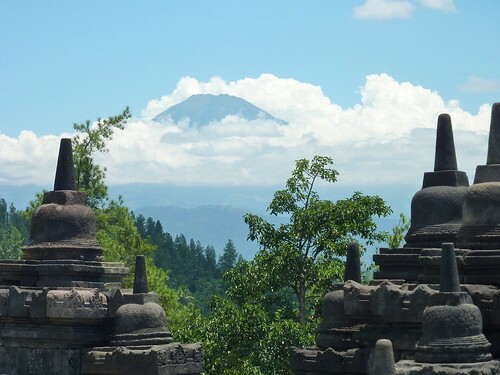 The locals pay RP2,000 – we got charged RP20,000 (£1.50); a typical tourist tax. The bus took about an hour, and you don’t get air-con luxury, but that’s what windows are for, right? 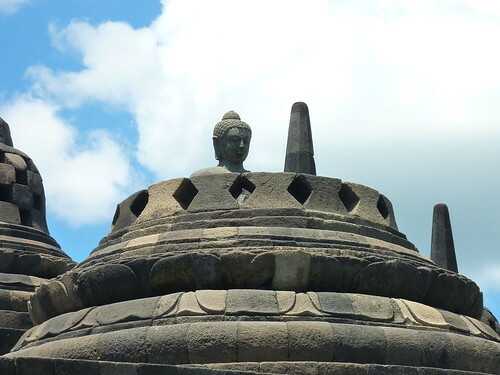 Borobudur: a 9th century Buddhist temple which (depending on who you ask) means "temple by the village of Bore", "ancient temple", "Bore mountain", and many other names besides. Basically, no-one knows. 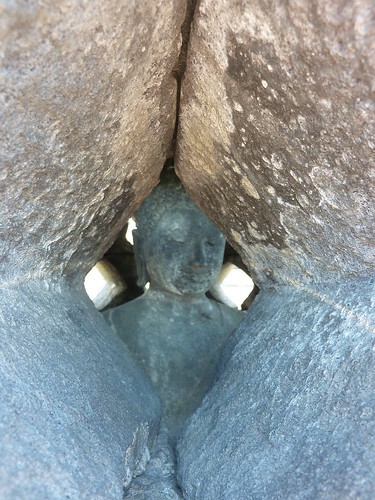 After the huge temples of Angkor though, it came as something of a disappointment. 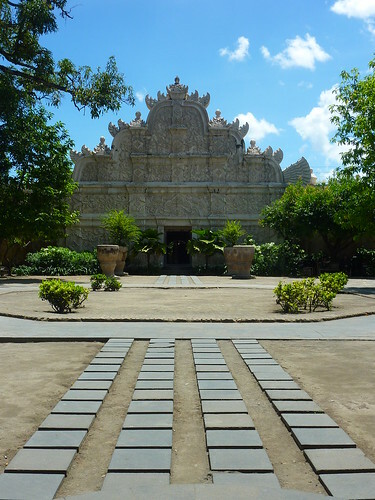 It was an impressive temple, no doubt, and hopefully the photos reflect this. Familiarity though, breeds - if not contempt - then a sense of "meh", for want of a better word. 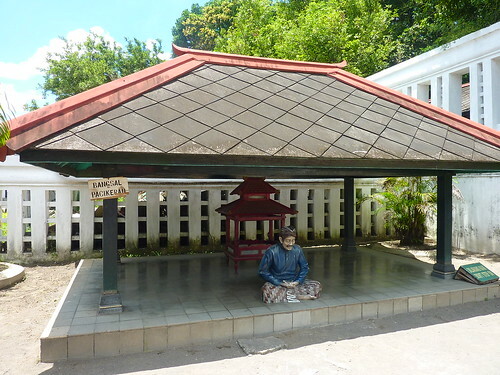 I think the heat probably didn't do it any favours; there are precious few places to get shade once you're on the temple itself, as it isn't actually a temple you can enter. You're given a sarong to wear when you enter, in order to show respect. What it actually does is fall off almost immediately, and you then have to choose between tying it up every three minutes, carrying it, or use it as a head scarf. I went for the last option, and thankfully I wasn't alone. 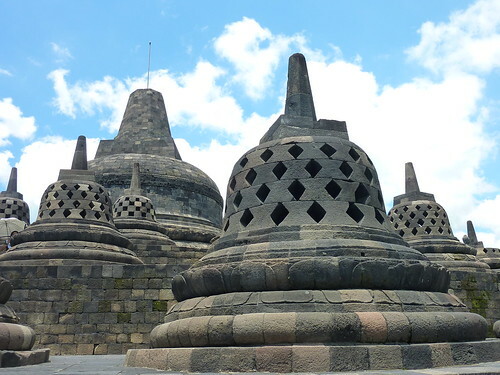 On the top level of the temple, there are perforated stupas which contain statues of Buddha. These are supposed to be lucky to touch the hand of, if you reach inside one of the perforations. 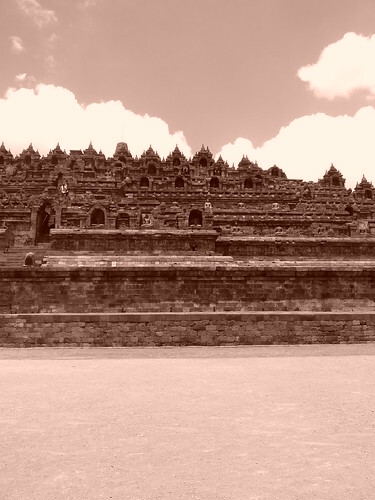 You'll see that there are very few tourists in these pictures; one of the nicer parts of Borobudur compared to Angkor is that the sheer volume of crowds just isn't there. This is, I suspect, partly due to the heat and the climb, and partly because we arrived near lunchtime. 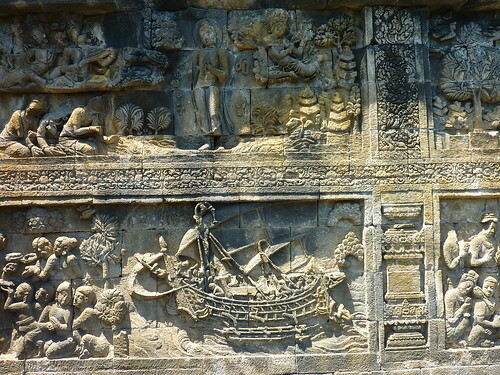 This intrigued several shipbuilders, who decided to build a replica based on this panel(! 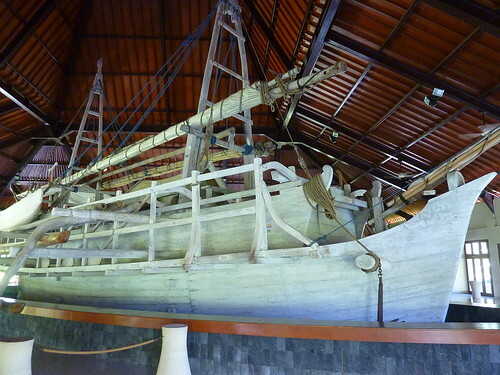 ), and then once the ship (named the Kapal Samudraraksa) was finished, got a crew together to sail it for 4 months in different parts of the globe. Amazingly, it didn't sink, and it is now part of the ship museum within the temple grounds. 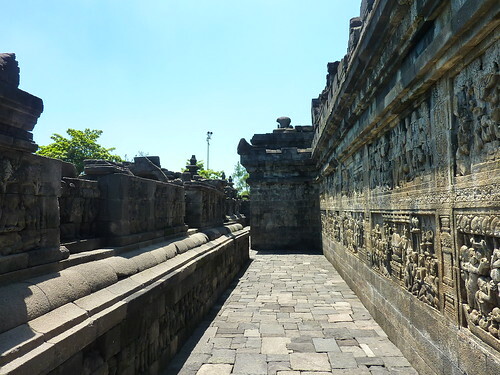 The other museum was a photographic exhibition of the reliefs found in Borobudur on the walls, along with their meanings. Unfortunately, a lot is lost in translation and there are a lot of photographs to look through if you're interested; most are online, so we decided to skip through this museum and head back. 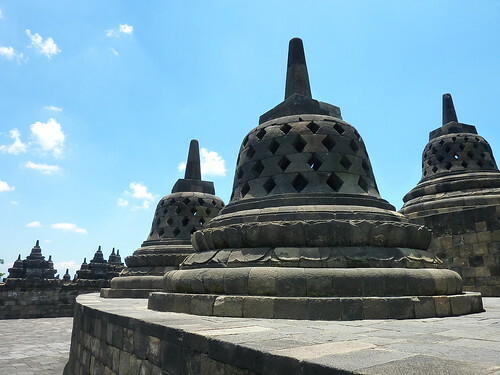 Borobudur was a pleasant, if hot, visit, and I'm glad we did it since we were in Jogja anyway, but it wasn't as mind-blowing as I was expecting. I think Angkor diminishes the awe factor for a lot of temples; I said to Gilly that Angkor should probably be the last set of temples you ever visit, once you've seen the rest around the world, or you'll always be making unfavourable comparisons. I'm not sure how places like Machu Picchu compare; maybe we'll find out one day. We got back in the afternoon and since we had time, we thought we would check out the Affandi Museum. We were short on time so decided to get a taxi; we were scuppered somewhat by the demonstrations over fuel taking place on one of the main roads, and had to bail out and walk the last kilometre on foot. Fuel price protests are taking place all over Indonesia, mostly organised by students. 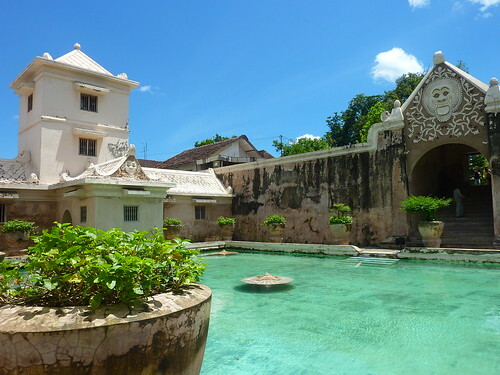 We walked past the one in Jogja, and it was pretty peaceful but very disruptive. Police had cordoned off the road and were just sat, watching. I have no idea if the government are taking any notice, but the effect on Jogja's roads (it's a comparatively small city) has been severe according to one person we spoke to. And that was it for our short stint in Jogja. 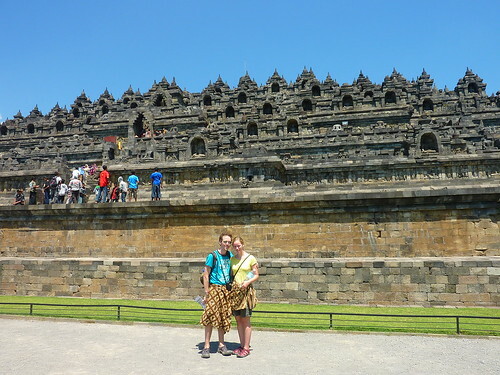 We were flying to Bali the next day and were planning to go straight up to Ubud, but we had learned that Paul and Fi were in Sanur waiting for a flight out in the next 3 days so we changed our plans and decided to chase them for a change! Sanur was supposed to be a pretty relaxed part of Bali, like a more "family-oriented" version of Kuta, with lots of resorts. Paul and Fi had found us a hotel next door to theirs which allowed us to use their pool, but with the benefit of having a cheaper room, which was a result. We were looking forward to some lazing around the pool for a couple of days.